Various civilizations have used culturally relevant stories to teach their people the importance of community and respecting the power of nature. Nearly every culture speaks of the common notion of the changes that life often brings. The Native American Thunderbird, who brings changes to the people, serves as a reminder that change is inevitable. Traditionally, tribal elders teach younger generations how to navigate through the emotional struggles of life by giving some explanation or insight into the purpose of fear and their struggles with change. The Thun­derbird is seen as an agent of change that helps determine be­havior within the dynamics of both family and community. Thunder­bird stories are a way of relating the people to the natural world by using metaphorical depictions of things that the people have always understood, such as birds that can fly or live in the sky (i.e., the heavens). The Great Unktehi and her offspring were said to have been the source of many floods when they “puffed” up their bodies, causing lakes, streams, and even the whole Missouri river to overflow. The Thunderbirds protected humans from these “water monsters” in an epic battle to make the world a safer place for people to live, and in doing so gained the water power by taking it from Unktehi. Some attempt to correlate the various stories from different tribes of indigenous people into modern Thunderbird sightings. However, when one looks a little more critically at these legends, it is clear they serve a much different purpose. 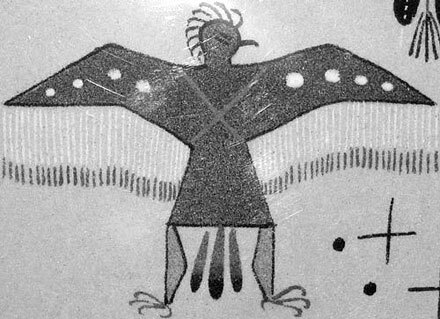 The Yaqui tribe also has its own legend describing a giant mythical bird. In the tale of the “Otam Kawi,” it is said that “a great bird lived on a hill of Otam Kawi. Every morning he would fly out in search of food. He caught men, women, and little children and carried them back to Otam Kawi to eat. In those days the people always were watchful. They couldn’t have fiestas because when they had pascolas [ceremonial dances], always two or three of the people were carried away by the big bird. 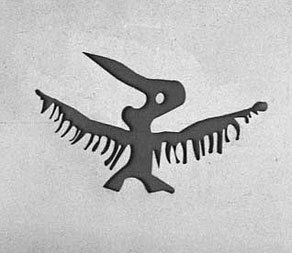 The Yaquis lived in hu’ukis, little houses made of mud and branches that looked like the house of a pack-rat, because they were afraid of the giant bird” (Giddings 1959). Rather than describing a Thunderbird, this account more closely resembles a creation story. The following quote provides some insight into the intention of this particular account: “There were cows in those days, but no animals of the claw” (Giddings 1959). Upon closer review, this particular story sounds much like the Navajo’s “Mon­ster Slayer” legend, an alternate creation story. The story follows the life of a boy whose parents were taken by the giant bird during the time when the earth was still unsafe for people. The grandfather makes the boy a set of arrows and a bow and as time goes by, the boy becomes a better hunter and grows stronger as he ages. One day he ventures off to avenge his parents’ killer, seeking out the big bird. The story describes the giant birds: “He saw everything; the size, the colors of the feathers, the big eyes, and all.” When the boy returns back to his village to speak to his grandfather about the things he saw while hiding in a hole near the giant bird’s mesquite tree, he gives another similar description: “I saw him. I saw all of his colored feathers and his big eyes.” When the other villagers catch word of what the young boy has seen, they all go to visit him to ask if he has really seen the legendary giant bird. The boy gives the following response: “Yes, I saw it. It has feathers of many colors, a big body, and long claws”1 (Giddings 1959). This is clearly part of the creation story of the Yaqui, which is not to be taken literally. Those who offer the Yaqui legend of Otam Kawi as historic evidence for the existence of the Native American Thunderbird are misrepresenting the actual accounts of these vastly diverse groups of people and their different tribal beliefs. However, Thunderbirds are unlike any extinct, prehistoric, or living species of birds presented by many cryptozoologists and monster enthusiasts because they are mythical creatures inspired by animals familiar to the groups of people living at the time these stories originated; they are intended as a way to explain the natural world. Craig Heinselman has contributed to cryptozoology with works such as Elemen­tum Bestia, which chronicles various subjects such as “elusive” prehistoric dino­saurs. In his article on Thunderbirds featured on Cryptozoology.com, he writes, “The evidence thus far for the existence of a large predatory bird in North America is based on historical and modern sightings and legends with no physical evidence, there is however two images of the Thunderbird, or at least a large bird” (Heinselman 2011). Claims of modern Thunderbird sightings are not even supported by Native Amer­ican stories. No person has ever seen a Thun­derbird, even in dreams or in the “visions” of medicine men. According to the Native Amer­ican mythologies, Thunder­birds have no actual physical form. Most accounts resemble any other modern citing of a large bird-like shape with the potential of being misjudged in size and distance, which is notoriously common in eyewitness accounts. Some stories and reports offer various bones, possibly fossils, of large birds as physical evidence of Thunderbirds, but they are not necessarily the same creatures mentioned in these “sightings” from all around the world. The majority of the “evidence” proposed for this mythic bird-like creature is given as literal interpretations of Native American folklore, which as we have seen are erroneous. Any eyewitness sightings (and certainly those by non-Natives) by definition cannot be Thunderbirds. In fact, it may even be considered disrespectful to suggest that a person could see, or has seen, a Thunderbird. Some may have looked to the Thunderbird legend to help rationalize these various strange encounters that people experience, but in doing so they bastardize these legends, misinform their readers, and do a disservice to the people and their tribal culture. If any part of the story should be taken out of the legend of Wakinyan Tanka, it should be that Thunderbirds are a link between the supernatural and natural worlds. They do not exist, but they are very real in the hearts and minds of Native American people. Coleman, Loren. 2010. Men in cryptozoology (blog post). Cryptomundo (June 14). Available online at www.cryptomundo.com/cryptozoo-news/mencz-hall/. Lame Deer, John. Wankanyan Tanka, the Great Thunderbird. In American Indian Myths and Legends, selected and edited by Richard Erdoes and Alfonso Ortiz, (New York: Pantheon, 1984): 218–222. Giddings, Ruth W. 1959. Yaqui myths and legends. 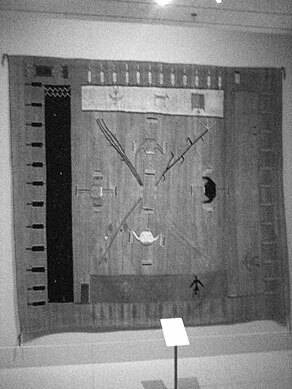 Anthropological Papers of the University of Arizona 2: 78–83. Heinselman, Craig. N.d. Thunderbird. Available on­line at www.cryptozoology.com/cryptids/thunderbird.php. Noah Nez is a Native American skeptic living in Arizona; he is a member of the Phoenix Area Skeptics Society (PASS) and author of Native Skeptic, a blog that looks at critical thinking from a Native American perspective.